Many men and women grind their teeth at night, which can lead to jaw problems such as TMJ disorder and can wear down or crack the teeth. If you consistently wake up with a sore jaw, headaches, or both, you may be grinding your teeth during the night while you sleep. If you want to stop grinding your teeth at night, there are a number of treatment options available depending on the root cause of your grinding. Boston dentist Dr. Ryan Clancy has extensive experience with tooth grinding, TMJ, sleep apnea, and other disorders. Call Dr. Clancy at 781-350-4385 to schedule your consultation today. Teeth grinding can be an underlying symptom of conditions such as TMJ disorder or sleep apnea, so if you suspect you are grinding your teeth in your sleep, you should visit Dr. Clancy as soon as possible for a consultation. 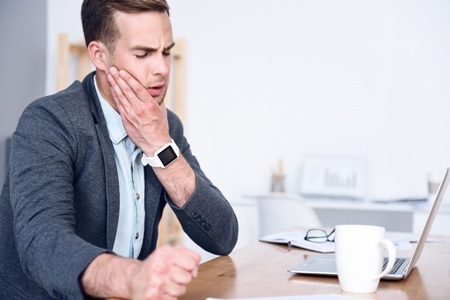 Left alone, teeth grinding can cause damage to the teeth and can result in worse TMJ symptoms that can dramatically reduce your quality of life. There are many different treatment options for teeth grinding, depending on what the underlying cause is. If your teeth grinding is due to stress and anxiety, you might want to consider seeing a therapist to help you work through it. In the same vein, if you drink a lot of coffee or alcohol, consider cutting down and seeing if that helps. If you are undergoing a lifestyle change that may take a while to see fruition, a night guard can help you to protect your teeth while you work on the underlying cause of your grinding. A night guard doesn’t prevent the jaw from clenching, but it does protect the teeth from being damaged and worn down. Full face orthodontics is a relatively new service that Dr. Clancy offers which helps to align the teeth and jaw without any surgery or extractions. He will look holistically at the entire head and neck, and create a fully customized plan to ensure proper alignment and jaw expansion in order to prevent TMJ and other problems. These may help in the short term while you work on a more permanent solution. If you have been suffering from teeth grinding at night, don’t hesitate to contact Dr. Clancy at 781-350-4385 to schedule your consultation. We serve patients in Medford, Malden, Cambridge, and other nearby areas of greater Boston.